I mentioned previously that I started working on a Margot for my Mom for Christmas, as per her request after the pattern came out. We went to the yarn store together and she picked out Rowan Lima (score! ), a new nylon/merino/alpaca braided yarn in two colors (Chile and Pampas) to make a two tone version of the pullover. After ordering the discounted yarn from Webs, I was ready to settle in for a relaxing, almost entirely stockinette knit. 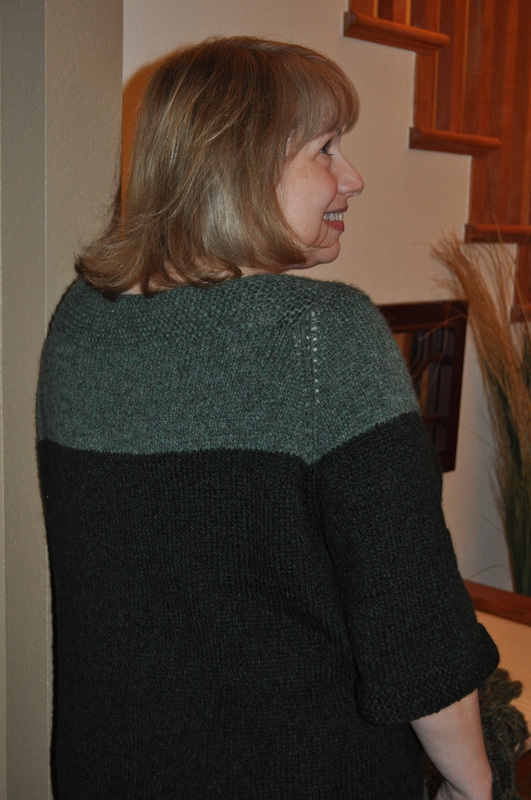 Mom’s Margot did not disappoint in the relaxing knit department, and the Lima was wonderful to work with. This is some of the softest stuff I’ve used, and I like the way it fills in once it’s knit up. The braided nature of the yarn leads to sort of blended stitches, so the fabric looks very cohesive and the little details that alter it show up all the more (like the small holes at the yoke increases). I think that my Mom really loves Margot, and that the two tone version turned out to be quite flattering. The two greens that my Mom chose are gorgeous, with so many subtle colors (there’s even purple somewhere in that dark green!). I’ve made her promise that she will actually wear it and not just wrap it up and “put it in a safe place”. 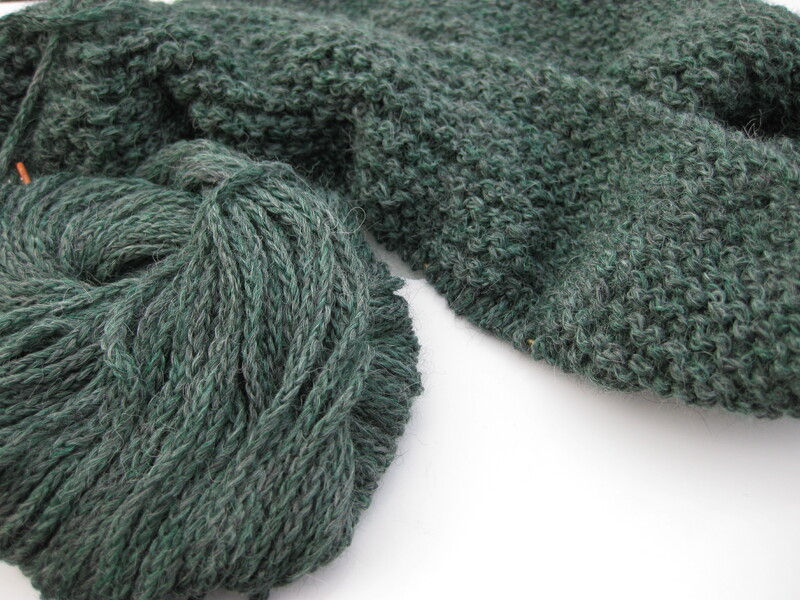 When working with alpaca, I’ve found (as have many others, I’m afraid), that the yarn has a tendency to stretch. 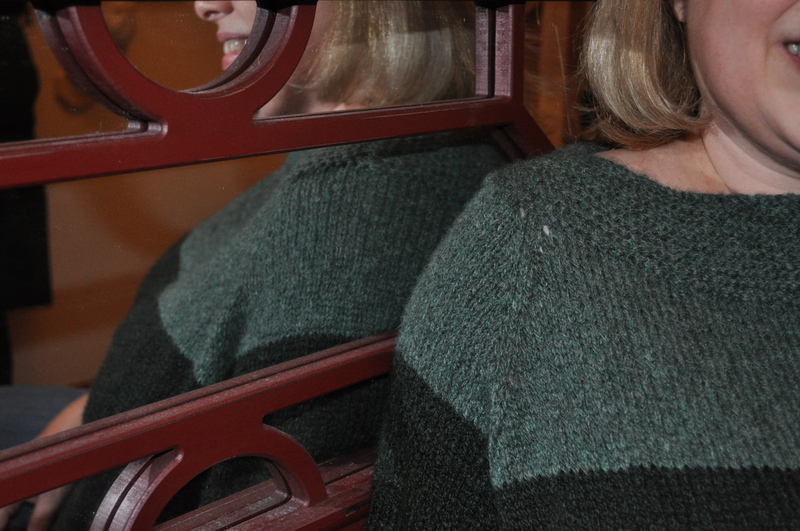 Margot already has such a stretchy garter stitch neckline, that the neck was loosing a lot of it’s shape (i.e. making Mom look like an extra from Flashdance). We decided that the cast on edge needed a little bit of reinforcement, so I took a double strand of the lighter color yarn and ran it all the way around the neck, going into each stitch on the cast on edge. It didn’t take as long as it sounds like it would! 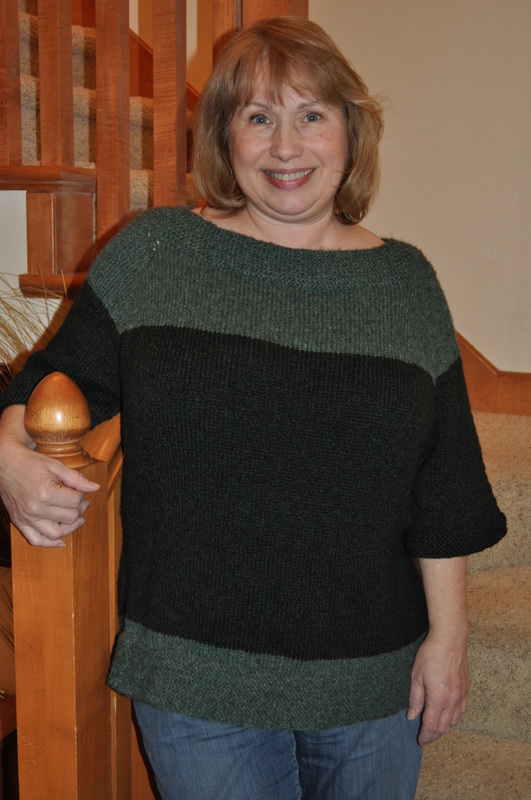 This created sort of a drawstring, only I didn’t cinch the neckline in, we just adjusted the neck to the width Mom wanted and then I wove in both ends of the “drawstring” so that it would stay in place. The fix seems to work well – we’ll have to see if it gets stretched out with time, but I can always readjust it if it does. Aww, Mama, you look so pretty! 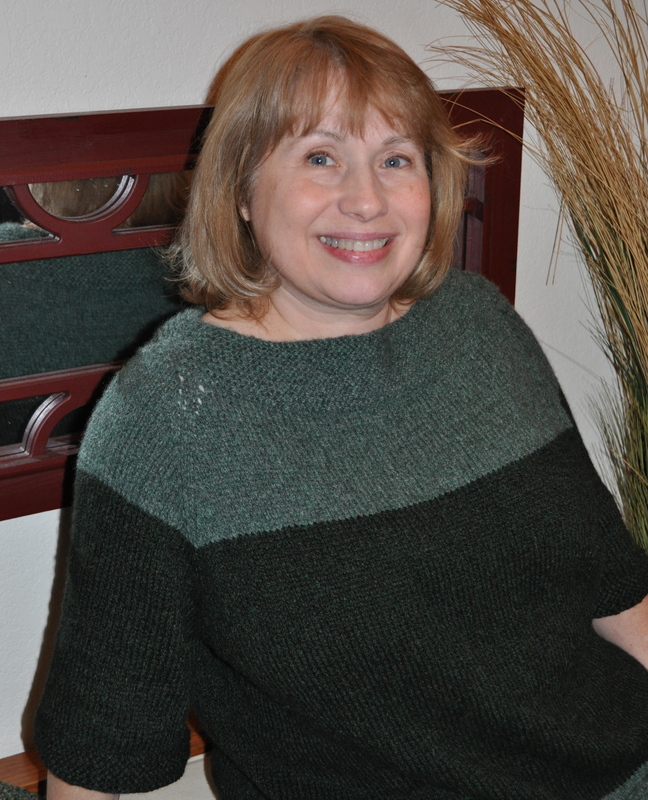 My dear friend Deirdre recently celebrated her birthday and, since it’s been a while, I wanted to knit something for her. I started working a simple triangular shawl with the Malabrigo Sock I got at Stitches, not really knowing where it was going to end up. For a while it was going to be an Ishbel, but I thought that something simpler would be more suited to Deirdre’s tastes. I decided to add a light lace panel, made up of yarn overs and decreases worked on every row. I finished it off with a few rows of garter and it was good to go! 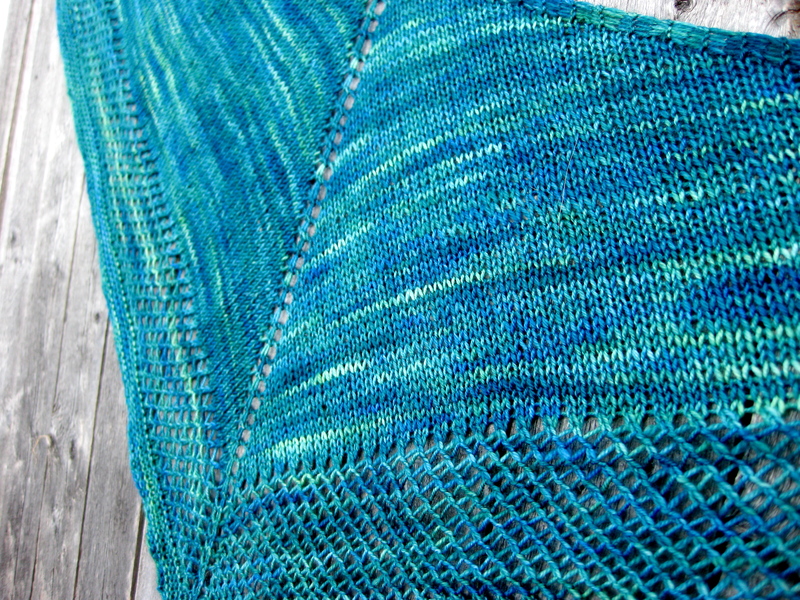 By increasing at the sides of the shawl every row, Deirdre (as I will henceforth be calling the little shawl) is nice and shallow – offering lots of length to wrap around your neck with a little bit of thickness in the middle to keep you warm! 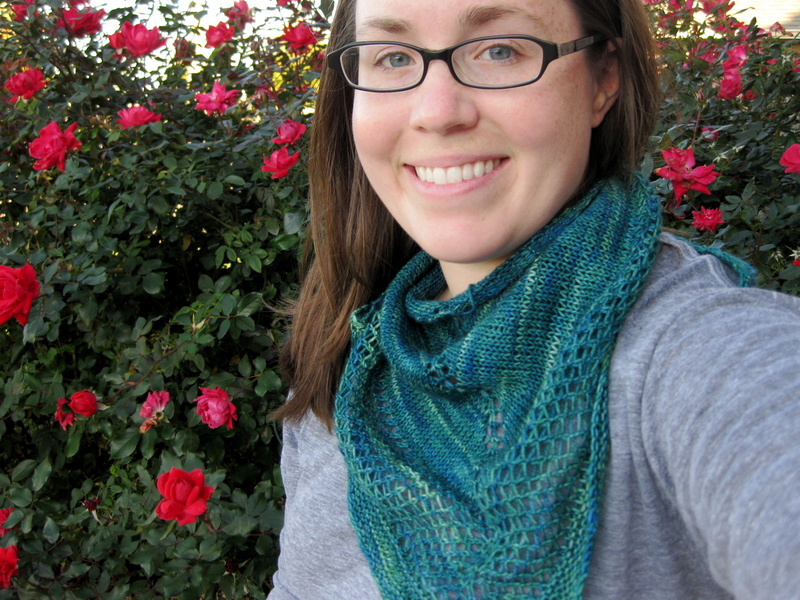 : ) I really like how Deirdre turned out, and I’ve got half the skein left for something else! As far as other knitting, I’ve been working on a few designs that I can’t yet share. Boo! But I’m also creating one thing I CAN talk about. I’m really excited about starting a Margot for my Mom. When I was home a couple of weeks ago Mom and I went yarn shopping and she fell in love with Rowan’s new Lima, an alpaca/merino blend. I didn’t need to fall in love, because I saw it at stitches and was already smitten. Mom agreed to finance the project, which I think makes this whole thing more of a gift for me than for her! I’ve made it through almost half of the raglan increases and I’m still loving this yarn.